The Pokemon-e Skyridge set has 6 Pokemon with the new Crystal Type Poke-Body power that lets them handle whatever types of Energy you want to deal out. This exciting set also introduces evolved Pokemon with healing abilities that activate whenever you attach Energy, as well as an exciting, new mechanic - Mystery Plate. Gear up Xatu with Technical Machines, recruit Colorless Pokemon, and power up with all 6 basic types of Energy to help you crank out win after win. This deck contains 26 Energy cards, 3 rare cards, some in multiples, 11 uncommon cards, some in multiples, and 20 common cards, some in multiples, for a total of 60* cards. *This total does not include the foil card. Each player must have a 60-card deck of Pokemon cards to play. 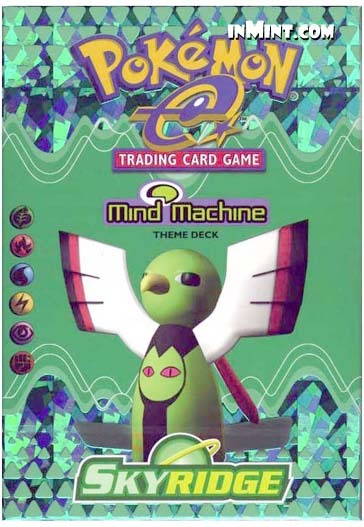 All "Mind Machine" theme decks contain the same cards. Some cards can be run through the e-Reader (for the Game Boy Advance) to unlock additional functions. E-Reader and Game Boy Advance sold separately. Recommended for players ages 10 and up.